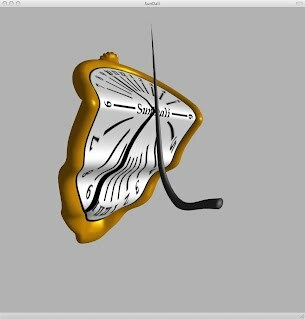 A melting pocket watch has been combined with Salvador Dalí's right mustache to produce a new surreal timekeeping device: a SunDalí. The SunDali is here a virtual sundial, which you can put on the screen of your Macintosh. The SunDalí inhabits a surreal 3D soundscape of moving natural and man-made sounds, accompanied by folk tunes from northern Spain. Use it to check the time day or night. At night the mustache casts a glow. 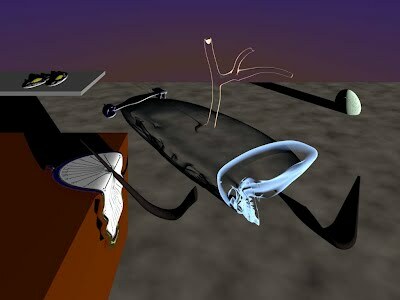 You control the movement of the 3D watch, and control the soundscape. Use headphones for best 3D sound effect. It can use the location to indicate the true solar time, as would be shown by a physical sundial at your longitude. The Mac OS X version adds another window to what is available in the iOS version. 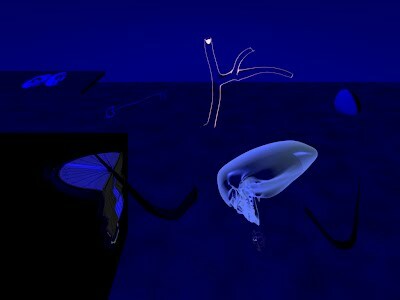 With ⌘0 You can open a window into SunDaliWorld: a 3D rendering of a scene featuring a SunDali with elements reflecting Dalí's "Persistence of Memory" and themes in other works. The time in that world is the same as that shown on the SunDalí. You will have thousands of wallpapers available: you can set the displayed SunDalíWorld image as the desktop picture for your screen. Download, free for a limited time. (but please consider donating through the button below to encourage my work). Once you've downloaded and used the program, please let me know who you are and what you'd like to see in future releases through the registration form.